A real adventure with pack horses. NO SMALL GROUP SUPPLEMENT - Rate guaranteed for 2 riders and over. + 80 € / pers. (2 nights in Ulan Bator only). Day 0: Meeting at the check-in counter of the domestic flight at Ulan Bator Airport. As this tour is designed as an add-on of our other riding tours in Mongolia, the transfer to the airport is included in your first tour and the guide will give you your flight tickets and help you for checkin. Day 7: Transfer to Ulan Bator airport on time for flights departing after 07:10am. Tour and visits as described, 2 domestic flights, horseback rides as described, full board from dinner of day 0 to breakfast of day 7 except 2 dinners, English speaking translator, Russian 4x4 with driver, a cook per group over 4 persons, nomadic equestrian guide, financial guarantee of your deposits. International flights, 2 dinners, drinks except water, tea and coffee, personal expenses, travel insurance, visa if necessary. Fancy a 2 or 3 weeks horse riding tour in Mongolia, but you want to discover the full diversity the country has to offer? 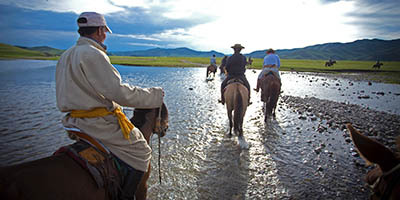 This tour is for you, as it can be booked as an add-on to our 8 and 13 days equestrian holidays in central Mongolia. For example, combined with our Yurt Comfort Trail or Gobi and Steppes Ride, you will ride on horseback from the Gobi Desert to the border of Siberia! Domestic flight to Moron at mid-day. Transfer to Khatgal, a touristic village at the southern edge of Lake Khuvsgul, and then to the East bank, much wilder and remote. We reach our yurt camp by the lake shore, in a beautiful setting with breathtaking views of the blue lake towered by the mountain ranges of the western shore. Dinner and night at the yurt camp (2 to 4 riders per yurt, with single beds, showers in a separate building). The next 4 days are devoted to a horse ride in the forests surrounding the Lake Khuvsgul. We ride deep into the wild forests that border the eastern shore of Lake Khuvsgul, with pack horses. This side of the lake has almost no motorable track and is inaccessible to vehicles. We ride in a really wild and pristine environment. We make our way on horseback through the forests and hills, always with blue reflections of the lake in the background. Every night, we camp in the wilderness. In the evening of day 5, we return to the yurt camp where we started the ride. After breakfast we drive to Moron airport for our return flight to Ulan Bator. Lunch according to flight schedule. On arrival, transfer to our 2* hotel in the city center. This hotel is perfectly located 200 m from Peace Avenue between Sukhbaatar Square and the State Department Store, which gives you a large choice of restaurants and the opportunity of last minute shopping at the department store which remains open late. Visit of the Choijin Lama Temple and Museum, whose traditional architecture offers a surprising contrast with the Blue Skye glass tower. Visit the Bogd Jhan Winter Palace. The Bogd Khan had several palaces but the other ones have been destroyed by Russians. Consisting of 6 traditionnal buildings, you will also see many objects that reflect the magnificence of court life at that time. The rest of the afternoon is dedicated to shopping in stores downtown, where you will find traditional clothing and objects of daily life. 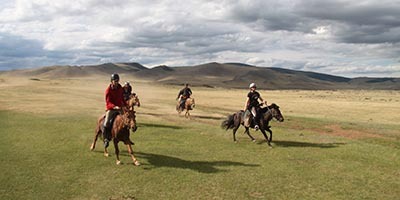 This horse riding tour in Mongolia is for experienced riders only. "We created this trail for riders who want a longer equestrian tour in Mongolia, and who want to discover very diferent landscapes. The eastern shore of Lake Khuvsgul is one of the wildest regions of Mongolia." This 20 days horse riding tour visits Arkhangai, White Lake, Khorgo Volcano and Lake Khuvsgul! This 2 weeks ride takes you to the famous Orkhon Valley, a World Heritage Site, for an equestrian adventure with pack yacks.